Mr. Magician is the perfect addition to any magician's performing routine. 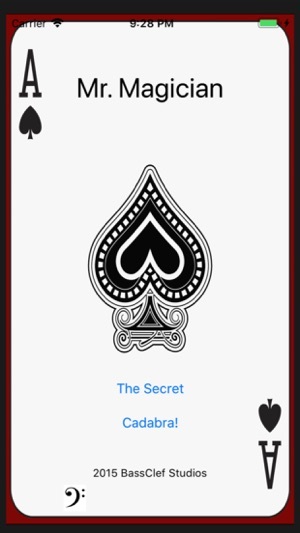 After your spectator selects a card, you simply call Mr. Magician and HE will reveal their card (via speaker phone). Mr. Magician is available 24 hours a day, 7 days a week - and is NEVER wrong. This is a wonderful and magical digital demonstration of mentalism! I’ve done this trick for years for my children and their friends over the phone! (But I needed a live by conspirator to know the verbal sequence to complete the feat!) These guys have made this a well thought out and smooth app for some magical fun. I’m sure to get lots of use from it! I see there is an upgrade to 2.0 but I can’t seem to find a description of what is different (better?) in the newer version. Any help out there?